"Pronounced through a series of blinks." That's Optikk's real name, according to the cardback for this 2010 action figure. Standing the standard 7-inches tall, the figure has about 18 meaningful points of articulation and close to no character recognition. A "Space Mutants" sticker on his package sets him apart from other figures, and for good reason. This character comes from the late-1980s The New Adventures of He-Man line, which carried over very little from Masters of the Universe outside of He-Man and Skeletor. If you've played around with any Masters of the Universe Classics figures you basically know what to expect-- lots of articulation, a hefty feel, and a design that mixes what's modern with what you imagined the character to look like during its original release. 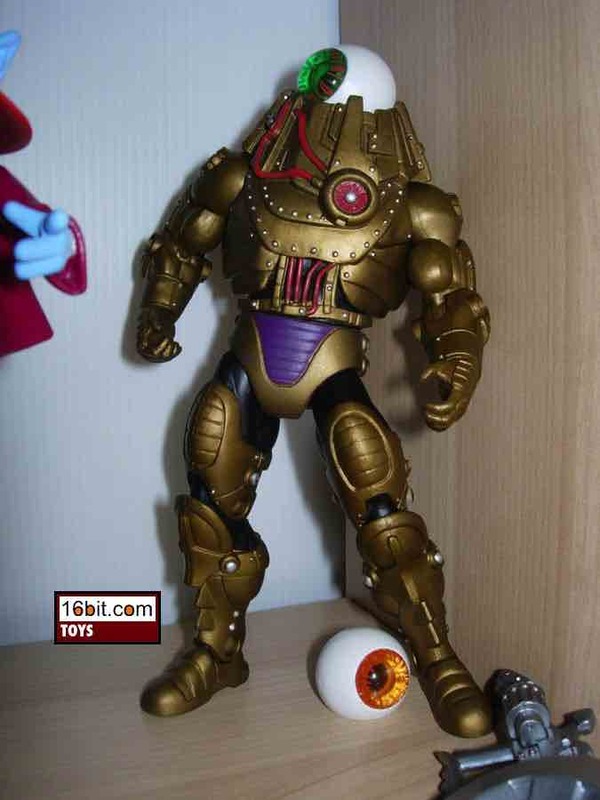 Rather than make a new sculpt true to the original figure, Mattel adapted existing parts from Trap Jaw and a new piece of armor with a new head (eye) sculpt and extensive use of a dull gold color. I'm a little afraid the gold will tarnish or rub off with time, so I suggest being careful when storing this figure-- heat and scratches are bad. Oh, and the armor has a dial on the back which is purely cosmetic-- it doesn't let the figure's eye turn or anything, you'll need to do that manually. Aside from the gold, the figure is peppered with all sorts of little extra flourishes. There are silver bolts, red wires, some purple on his codpiece, and of course, his eye. You can switch between a green eye or an orange one, one of which is a modern reinterpretation and the other is a nod to his original figure from (roughly) 1990. Sure, you'll probably see his legs reused on the future Man-E-Faces figure, but what you have here is a nice, most likely new character to add to Skeletor's army. The Four Horsemen did a great job sculpting this one, and his accessories are pretty great-- even if the shield wasn't in with the original figure.